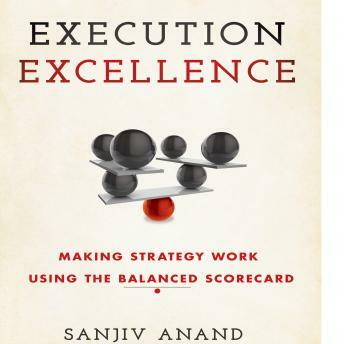 Execution Excellence is the practitioner's guide to real-world implementation. Designed by a Balanced Scorecard (BSC) thought leader with 30 years of experience and over 300 global implementations under his belt across a range of industry sectors, this guide gives you a hands-on framework for putting the BSC methodology into action. Clear, and concise, this audiobook skips the theoretical exposition to get right to the point - how can companies use BSC to effectively deploy strategy and drive individual and enterprise performance? You'll find the answers here. The discussion outlines the ways in which firms commonly fail in implementing BSC. These failures can be traced back to common design and implementation flaws: making the process too complicated and focusing on the BSC process rather than the outcome. The discussion will also cover design optimization across a range of key industry sectors. You'll gain expert insight into avoiding these missteps and the practical tools and perspective you need to implement BSC correctly the first time. While the Balanced Scorecard framework is widely accepted and praised, about half of firms that implement it fail to realize the full benefits. The fault lies not with the framework, but with the design, and more importantly - execution. This book gives you the information and tools you need to adopt BSC successfully.